The global numerical weather prediction model ARPEGE (Action de Recherche Petite Echelle Grande Echelle) is an essential tool for operational weather forecasting at Météo France. This system is fully integrated within the ARPEGE-IFS software that was conceived, developed and maintained in collaboration with ECMWF. This software possess most applications that are necessary for operational numerical predictions which ensures full consistency between computations performed during the analysis, the model and the post-processing steps. As a new version is implemented every nine months or so, the code is continuously evolving to get the best out of the supercomputers, to assimilate data from new observation systems and to improve the components of the forecast model. The lifespan of the ARPEGE model goes well beyond any of its predecessors, being in use for more than 23 years now, against the old record of 8 years and 7 months for the Péridot model. The initial conditions of the ARPEGE model are based on a 4 dimensional variational assimilation (4D-Var) that incorporates a very large and varied amount of conventional observations (radio sounding, airplane measurements, ground stations, ships, buoys, etc) and also from remote sensing (ATOVS, SSMI/S, AIRS, IASI, CRIS, ATMS, SEVIRI, GPS sol, GPS satellite, SATOB, diffusiomètres, etc...). ARPEGE uses a set of primitive equations with a triangular spectral truncation on the horizontal, with a variable horizontal resolution, with a finite elements representation on the vertical and a “sigma-pressure” hybrid vertical coordinate. It also utilizes a temporal two time level semi-implicit semi-lagrangian scheme. The horizontal resolution of the ARPEGE model is around 7.5km over France and 37km over the Antipodes. It has 105 vertical levels, with the first level at 10m above the surface and an upper level at around 70km. Its time step is of 360 seconds. The wind horizontal components, the temperature, the specific humidity of water vapour humidity, and of four types of hydrometeors (cloud droplets, ice crystals, rain and snow), and the turbulent kinetic energy constitute the atmospheric prognostic variables of the model. The surface and the upper soil layer conditions are characterized by several prognostic variables (temperature, liquid and solid water content, etc). Monthly climatology files are used to describe physiographical properties of the soil, the vegetation , ozone and aerosols. The influence of physical processes (radiation, microphysics, surface processes) and the subgrid transport (turbulence, convection, gravity waves) on the evolution of the model prognostic variables are represented by the physics parametrizations. Radiative exchanges in the atmosphere (clear sky, clouds, Ozone, aerosols) and at the surface are computed every three hours, but separately for the solar (0.2 to 4mm) and the thermal (4 to 100mm) parts. Several phenomena linked with the subgrid orography, such as gravity waves, their reflection and trapping as well as upstream blocking are taken into account. The transport in the atmospheric boundary layer rests on a diffusion scheme whose transfer coefficients are dependent on the turbulent kinetic energy (TKE) and a mixing length, and on a mass flux shallow convection scheme. A mass flux scheme based on a moisture convergence closure processes phenomena associated with the deep convection (transport, clouds, precipitations, etc). The parametrization of resolved clouds uses a statistical representation of the saturation deficit and relies on an instantaneous adjustment between the three water phases. Microphysical processes linked to resolved precipitations such as auto-convection, collection, evaporation, sublimation, melting and sedimentation are explicitly represented. The “force-restore” ISBA surface scheme includes several important physical processes taking place at the soil-vegetation-atmosphere interface and in the superficial soil (heat and water diffusion in the soil, run-off, frozen soil, snow melting, etc) so as to assess the momentum, heat and humidity fluxes on continental surfaces. Ocean turbulent fluxes are computed using the ECUME parametrization whose transfer coefficients have been calibrated during many field campaigns. Four daily forecasts are made at 0, 6, 12.and 18h UTC, with forecasting time of 102h, 72h, 114h and 60h respectively. ARPEGE forecasts are used as lateral boundary conditions for the high resolution AROME and ALADIN limited area models. 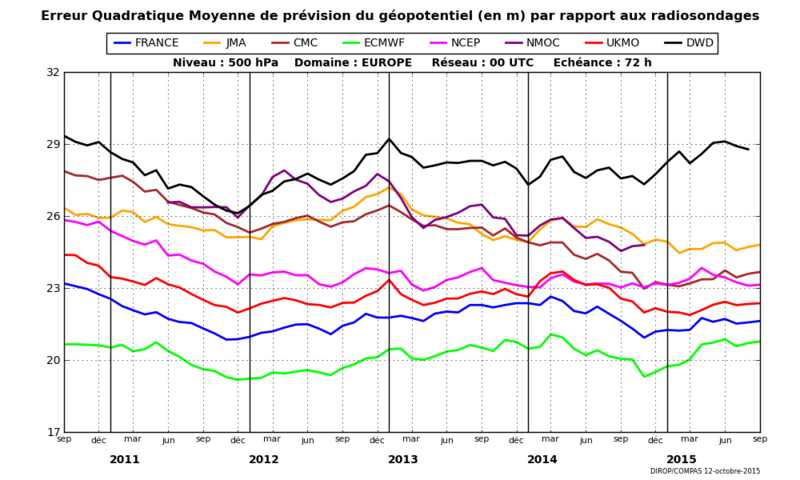 Model forecasts are interpolated on a five horizontal regular lat/lon grids, with one 0.1°x0.1° grid over the Europe-Atlantic domain and one 0.5°x0.5° grid over the Earth, and on several vertical level types (pressure, height, isoPV, etc). Finally, it is worth mentioning that the operational short range ensemble weather forecasting, PEARP (Prevision d’Ensemble ARPege) is also based on the ARPEGE model. This system, based on 35 members, seeks to understand and quantify the uncertainty inherent to weather forecasting. 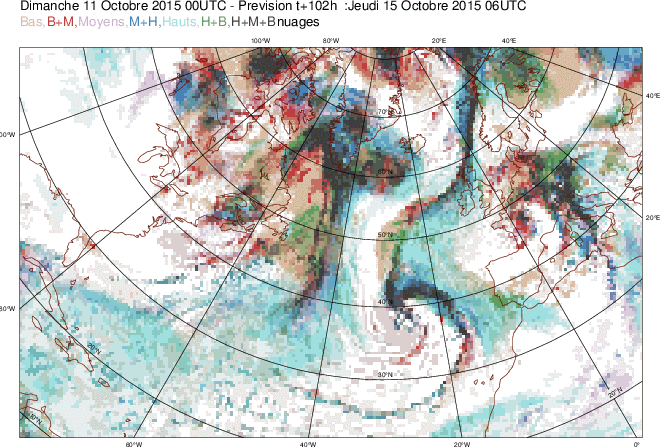 The horizontal resolution of the model is around 10km over France and 60km over the Antipodes.